I always love a good bargain on awesome beauty products. 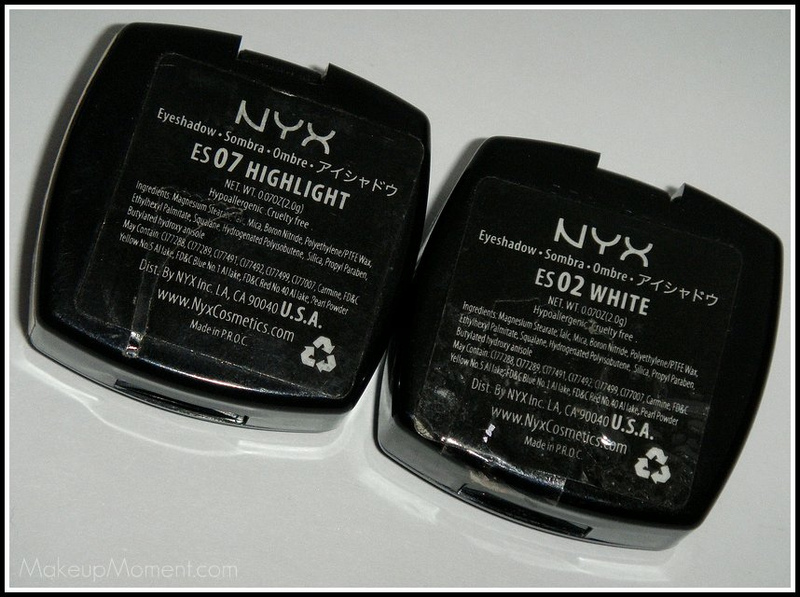 Affordable brands like NYX, are a great option to look into, if you are on the lookout for good quality cosmetics that won't break the bank. I have a few NYX lipsticks, and lip glosses which I like, but what I am most impressed with are their single eyeshadows. 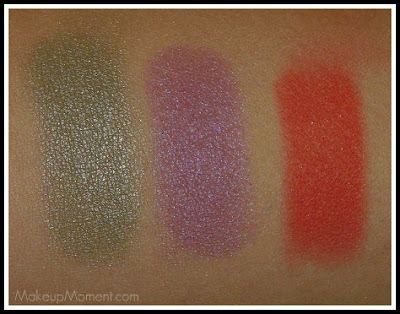 Not only are they inexpensive at just $5.00 a pop on the NYX website, but the eyeshadow pigmentation just blows me away. 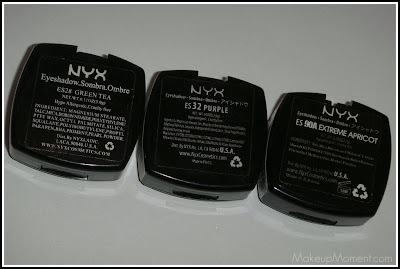 I don't have many NYX eyeshadows, but I really like the ones I do have. You better believe that I will be getting more next time I stop by my local beauty supply store, where they carry NYX products. Green Tea- Frosty, golden green. I admit, I have not used this shade much. But now that I look at it, I am definitely going to be getting more use out of it. I envision this color pairing great with a brown eyeshadow blended along the crease. Should make for a pretty soft, green smokey eye. Purple- Frosty purple. 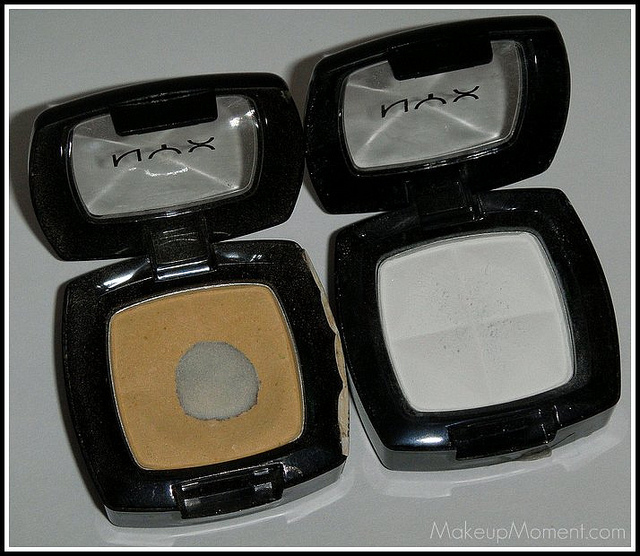 This eyeshadow was one of the first NYX eyeshadows I ever purchased. I got this along with another NYX eyeshadow called Golden-which is such a lovely color, but of course I dropped it and it crumbled to bits. I am telling you...I am super clumsy. Extreme Apricot- Matte, bright red/coral. When I saw this color, I just had to have it. Even though, I honestly don't use it much. But, it's because it is such a daring color. I really must make use of this gorgeous color one night. Highlight- Matte beige. This is probably my most favorite NYX eyeshadow. When it comes to a trusty, good brow bone color, this eyeshadow is the one I always reach for. It's an essential color to have in my makeup stash, and I recommend it to everyone. I love it so much that I have already hit pan on it. I have to get a new one pretty soon. White- Matte white. I really like this color for highlighting the brow bone, when I am doing more dramatic eye looks for nights out. The white color looks great paired with a gray and black smokey eye look. These eyeshadows from NYX blend super easily. The only thing I would say though is that, they are a little bit powdery. 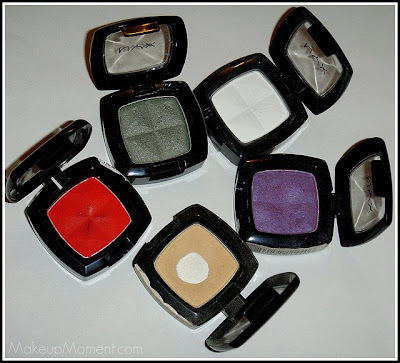 Also, make sure to apply these eyeshadows over an eye primer, to really get the most out of the colors. 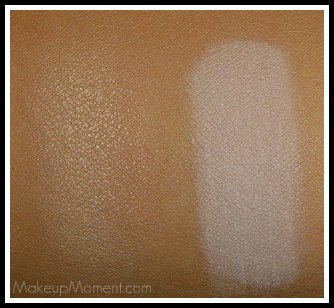 The pigmentation is nice already, but that primer really adds that extra 'wow' factor. 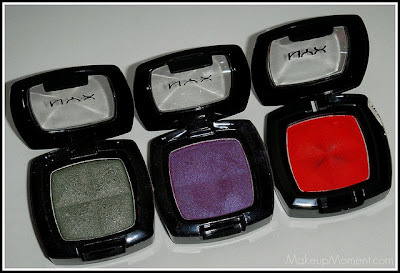 Check out www.nyxcosmetics.com, to check out NYX eyeshadows and other products. 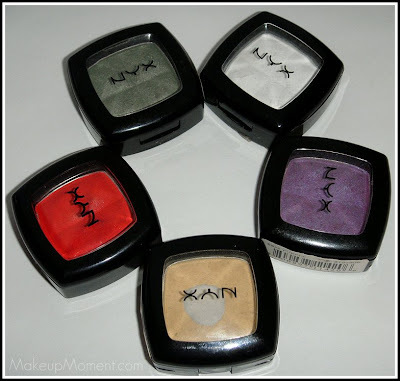 What are your favorite NYX eyeshadows? Disclaimer: I am not affiliated with any of the companies mentioned above. I purchased the products mentioned above for my personal use. I love NYX eyeshadows too. They are crazily pigmented and affordable. I wish they were more finely milled but still, with the price, I can live with that. I had a NYX single eyeshadow that is a dupe of Stila Kitten. It's extremely shimmery and I had to use a light hand.